7202 - CHEROKEE souvenir embroidered patch. 3" - Patches sew or iron-on & are carded to hang on a display rack for stores. 7203 - CHEYENNE native American Indian embroidered patch. 3" x 3.75" - Patches sew or iron-on & are carded for a retail display rack for stores. Made in USA. 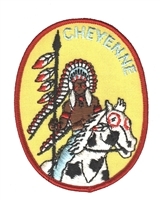 7221 - CHIEF souvenir embroidered patch. 3". Patches sew or iron-on & are carded to hang on a display rack for stores. 7204 - COMANCHE souvenir embroidered patch. 3" - Patches sew or iron-on & are carded to hang on a display rack for stores. 7215 - CUSTOMER HAD IT COMING embroidered patch. 3" round. Patches sew or iron-on and are carded for retail display for stores. 7205 - HOPI souvenir embroidered patch. 2.5" wide x 3.75" tall. Patches sew or iron-on & are carded to hang on a display rack for stores. 7211 - Indian Chief on white felt - large: 3.375" wide x 3.625" tall souvenir embroidered patch. Patches sew or iron-on & are carded to hang on a display rack for stores. 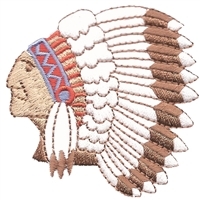 7212 - Indian Chief- medium on white: 2.875" x 3.25" souvenir embroidered patch. 2.875" wide x 3 1/16" tall. Patches sew or iron-on & are carded to hang on a display rack for stores. 7206 - IROQUOIS souvenir embroidered patch. 3". Patches sew or iron-on & are carded to hang on a display rack for stores. 7207 - MOHAWK embroidered patch. 3". Patches sew or iron-on & are carded to hang on a display rack for stores. 7208 - NAVAJO souvenir embroidered patch - 3" wide x 3.875" tall. Patches sew or iron-on & are carded to hang on a display rack. 7214 - SHAWNEE souvenir embroidered patch - 3" wide x 3.875" tall. Patches sew or iron-on & are carded to hang on a display rack. 7222 - SHOSHONE souvenir embroidered patch. 3" wide x 3.875" tall. Patches sew or iron-on & are carded to hang on a display rack. 7209 - SIOUX souvenir embroidered patch. 2.5" wide x 3.5" tall. Patches sew or iron-on & are carded to hang on a display rack for stores.